Learn to drive with our local, fully qualified, professional driving instructors. Our driving lessons in Pontefract provide expert tuition, excellent first time pass rate & our solid reputation for excellent customer service will help you pass your driving test with confidence. We have been offering driving lessons in Pontefract for many years now. Learn Driving UK is very pleased to be able to offer quality driving lessons to our customers. Pontefract is steeped in history and an iconic place to live, work, relax and learn to drive. Our driving test pass rate in Pontefract is high as our driving instructors in Pontefract know the area well and recognise the standard required for a driving test pass. You can be sure of a professional, local service at very competitive prices. If you are new to driving lessons in Pontefract, we start you off in nursery areas like Chequerfield and airedale. In Featherstone you will drive around the Green Lane industrial estate and Normanton.You will advance, at a rate which suits you, into more complex areas such as busy junctions. Normanton bypass is great for learning about roundabouts. You will also drive around South Elmsall, Kirkby Langthwaite Grange Industrial Estates. 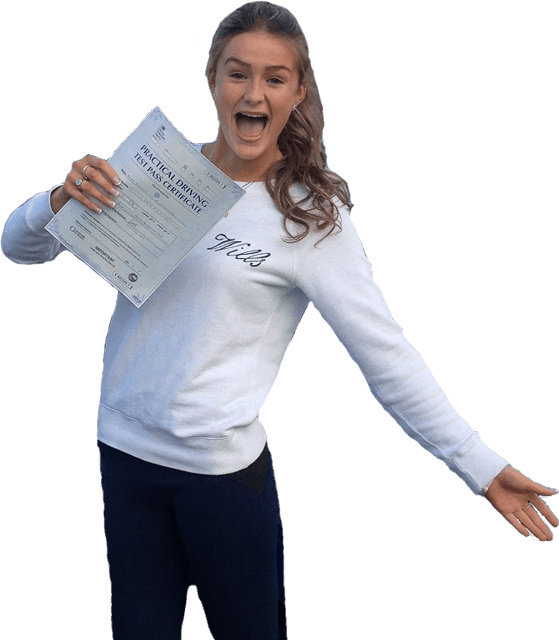 For those with some experience or who already hold a licence to drive, we start off with an assessment of your skills so that we can tailor a course of lessons suited to your needs. Many new starters are concerned about the manoeuvre exercises involving reversing. You will only be asked to carry out one of them on your driving test and, by then, you’ll have them mastered. Towards the end of your driving lessons in Pontefract, you will experience more tricky junctions (traffic lights, one-way systems) and busier roundabouts such as Hemsworth bypass. We will carry out regular assessments to check your progress and allow you to drive for longer periods independently. But don’t worry - we don’t expect you to run before you can walk. Your Learn Driving UK instructor will be with you all the way offering expert tuition and guidance when required. Waiting times for practical driving tests at the Pontefract test centre (Baghill Station Station Lane, Pontefract, West Yorkshire, WF8 1RB) can be a couple of months depending on the time of year. So, don’t be surprised if your driving instructor is pushing you a little to prepare for, and take, your theory test in Pontefract (you can only apply for a driving test once the theory test has been passed). Although our LDUK instructors know all the driving test routes they will not be restricting your driving lessons in Pontefract to those roads. We strongly believe in DVSA’s “safe driving for life” slogan and will be ensuring you get practice on as wide a range of roads and junctions as possible. If you live in Pontefract or any nearby villages be reassured that Learn Driving UK will endeavour to provide you with the best possible service, value for money and our commitment to your driving safety, at-all-times. Our team of local driving instructors all have excellent local knowledge to help you pass your driving test in Pontefract. Our friendly local driving instructors are CRB checked. Barry was highly recommended to me. I found it difficult to learn new things at first. Barry was very good, very friendly and makes you feel at ease. I wanted an instructor who was patient. The cost and personality of the instructor was very important. Learning to drive took longer than expected due to my own lack of confidence. Barry was excellent, very calming and lessons were straightforward. I would highly recommend Barry, I felt completely at ease. Someone who I knew and was patient and understanding, I knew Barry was both of these as people I know used him. learning to drive the second time around was very much more enjoyable and I looked forward to my lessons. Barry's methods were fantastic, especially since having bad experience with another instructor. I would definitely recommend him. I wouldn't chance anything I have no complaints. I wanted someone who explains well and had a good reputation. They needed to be easy to get on with and flexible too. Learning to drive was alright but some tricky points. Everything was explained and demonstrated well by Barry. I would highly recommend Barry and Learn Driving UK. Availability and a calm instructor were important to me when i was looking for a driving instructor. The type and feel of the car was important too. My driving test was very nerve racking, but my driving lessons were fun. Barry was very helpful calm and constructive. I would highly recommend Barry and Learn Driving UK because I passed first time with this company, failed twice with another. There's nothing i would change, Helen found me an instructor quickly. I wanted an instructor that i felt comfortable with. Barry was great. Learning to drive wasn't as scary as i thought it was going to be, i really enjoyed it. Barry's teaching methods were good, clear and easy to follow and i passed my driving test first time. I'd highly recommend him as he is very friendly and approachable. I chose LDUK because they had good feedback on Facebook. It was important to me that the instructor be calm and patient, Barry was great. I am satisfied with all Barry's teaching methods, he is very good. I would highly recommend LDUK and Barry because they have got good driving methods. I chose LDUK because of good feedback from other learners. I expected learning to drive to be more difficult. Barry's teaching methods were very good. I would highly recommend Barry as he is very nice and always a calm instructor. "I chose Barry as knowing that he's respected and I was given good reviews from a friend was very important. It was also important that we got along, and that the instructor be patient with the learner. Barry was great. I didn't think it would be difficult to learn but there are many things which makes driving more difficult. Barry was amazing, couldn't ask for a better instructor. I would highly recommend as great lesson prices, instructor is very good and friendly. I wouldn't change a thing". "I really wanted to succeed in passing and being a confident driver. I wanted a driving instructor that was trustworthy. Learning to drive was much better than expected. Barry was brilliant, and although at times I got confused Barry would always explain in a way that made sense. I would highly recommend Barry as he made me feel confident and he is reliable". Thanks Barry for getting me through my test at the first attempt. I really enjoyed my lessons. You were recommended to me by a friend. My lessons were relaxed and stress free. I felt very comfortable learning with you. I now plan to get a car so i can drive to work and i can help my mum and dad. I'd seen Barry's car a few times and I asked for a business card. Barry is a very good, very easy to get on with Instructor. Our lessons were always planned really well. Barry is an excellent instructor and good company. I'm going to drive for as long as I can now and take my friends to Brid for the day. I chose Learn Driving UK as the school looked so professional. I got there contact details from there website www.learndrivinguk.co.uk. If I could sum up my driving instructor Barry in one word it would be 'God send' My lessons were of an extremely high quality. I now want to pass my bike test as 2 licences, more choice. First time pass for me in Pontefract with Barry Woodward. Barry is excellent, friendly and really built my confidence. Very good instructor, I learnt a lot. Thanks Barry. Now I'm going to buy a car. I had a brilliant experience with fun throughout learning with Barry. I found LDUK on the internet. My lessons were excellent and I felt comfortable. I will now be able to drive myself to work. Learn Driving UK & Barry were recommended to me by a friend. Barry was absolutely amazing, I've loved every minute of it. Barry has been so kind, patient and friendly. I'm now going to carry on in my car and go on to do the pass plus Course. Barry's great and very patient. I passed my driving test with Barry Woodward in Pontefract.. I chose Learn Driving UK because of all the good deals. I found them on the internet. Barry has been great and very patient with me. I have already recommended him to people i know. Now i can go driving. Barry was recommended to me from friend I passed first time. I think that says everything about how good an instructor barry is! Thank you! I will definitely recommend Barry to everyone. I like the way Barry taught me to drive specially when I get ready for my test we did few mock tests and I think that's helped me a lot. I'm looking for my own car, I think my first car will be a Ford fiesta. Barry Woodward was recommended to me by a friend. Barry always made me feel relaxed on my driving Lessons, he is very good at his job. Now that i have passed my driving test it will really expand my job prospects. Barry was recommended to me by a family friend. Learning to drive with Barry was really good. Everything was explained to me in a calm manner. Thank you Barry. Now i want to get a car as soon as possible.